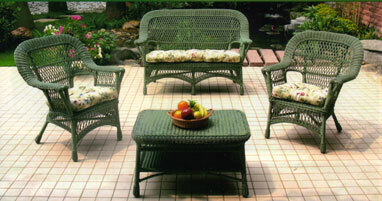 Cleaning and caring for your resin wicker furniture will guarantee that you will be able to enjoy it for many years. It will be a backyard staple for as long as you want if you follow these simple steps. Please remember that the following tips are specifically for resin wicker. If you have rattan, reed, or bamboo pieces, please follow other specific cleaning and care instructions. Resin is resilient and made for outdoors and the varying weather, so it can take a bit more scrubbing and cleaning than other wicker pieces. Soak the furniture in water with a hose or by dumping buckets of water on it. Gently scrub the furniture with a sponge you dunked in the warm, frothy water. To loosen hard spots, and to spot treat or get in corners dip the soft bristled brush in the soapy water and scrub lightly. If you have sap, mold or other hard to clean spots use your goo gone or other cleaner now. You MUST rinse them thoroughly or they can discolor your furniture. Rinse the entire piece with a hose. You may wish to dry it with a towel before leaving it in the sun to prevent water spots. By cleaning your furniture several times a season and ensuring any sap, mold or other debris are taken care of quickly you will prolong the life of your furniture and it will always look new. Enjoy!